Consumers have never had more options when it comes to choosing how to get from point A to point B. With so much variety in travel choices, it’s no wonder that past prohibitively expensive options such as chartering a private jet can actually be cheaper than flying commercially. This rings true even more so for businesses. In this study, we’ll be examining the benefits of traveling via private jet charter for a group of 3-5 corporate executives versus through business and first class. Commercial air travel is the traditional mode of transportation for companies that need to send their executives across the country or the globe to do business in person. But it may surprise you just how much time is wasted going the commercial air travel route. Commercial: Typical commercial air travel comes with a host of time delays, as most travelers already know. For example, according to data from the Bureau of Transportation Statistics, 21.3% of flights are delayed an average of 57 minutes. That being said, the average delay time of all flights can be summed up as 12.1 minutes for every flight. If your party has 4 executives and at least one connecting flight, that adds up to 6min of extra labor your company is paying for a round trip, just in delays alone. What’s more, enplaning and deplaning can take an extra 30-40 minutes per flight, depending on your aircraft. That again tacks on at least another 8 labor hours to the trip. So far, taking a commercial flight has cost you 673.6min of labor costs just from delays and boarding the plane alone. Private: Flight delays are much less common for private air travel. In fact, according to the Bureau of Transportation Statistics, almost 70% of delays were caused by airline-specific problems ranging from late aircraft arrival to cancellations. On the other hand, with private flights, this group of 4 executives will cost nearly an hour less in labor costs for the same trip. Enplaning and deplaning could easily be cut in half (at least) since the group is so small, saving you 4 hours. Private air travel, then, has already saved you 299mins in labor costs (at 374.6mins total in delays and boarding). Here is where the numbers really start to come together. 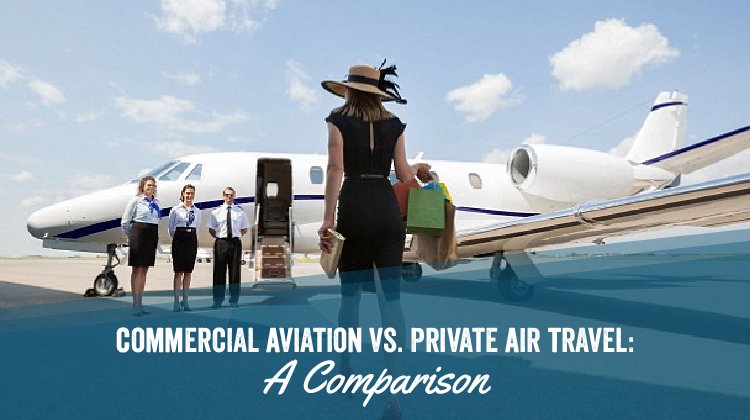 Below, we compare the average ticket costs for both commercial and private travel, as well as the added labor costs. Ticket Costs: Ticket costs are especially difficult to measure, as each airline and flight can vary wildly. Conservative estimates, however, would likely price business class as costing about 5 times as much as an economy seat, and first class only going up from there. As the average cost of airfare in 2016 was about $349 for a round trip. Thus, the total cost comes to around $5235 in business class and anywhere from $6,000 to $12,000 in first class. Chartering a private jet, on the other hand, can cost as low as $1200 per flight hour, possibly saving you $400 over business class and potentially thousands over first class. Labor Costs: One of the biggest benefits of chartering a jet is the saved labor costs. If your group of 4 executives each make $150,000 a year ($72.11/hr and $108.17/hr with overtime), simply chartering a private jet can save you $360 to $540 on this trip alone. What’s more, since 86% of executives say they travel 1-10 days a month, you could be saving anywhere from $4300 to $6500 a year in labor costs by chartering a private jet. When it comes down to price alone, chartering a private jet is not only a financially viable alternative to commercial corporate travel, it can even end up saving your company money. And when you add in the additional benefits of comfort, service, and valuing your executive team’s time, it chartering a private jet is the best travel choice.